Steve and Vanessa are getting married in March. It seems like a ways away, but I know time will fly and it will be here any day now. 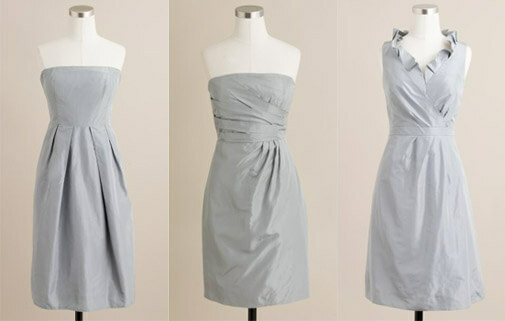 As part of the preparations, I need to decide on a bridesmaid dress. The bridal party is choosing from the J. Crew bridesmaid collection in aluminum and pairing the dresses with fun, colorful shoes. I’ve narrowed it down to these three, but I’m still having trouble deciding. I think their wedding is going to be so fun and personal and I’m really excited for it! This entry was posted in fashion, weddings and tagged bridesmaid dresses, jcrew. Bookmark the permalink.